Post-Traumatic Stress Disorder (PTSD) is often associated with returning war veterans or first responders. However, children and teens are at a significant risk, as well. Because a child’s emotional coping responses develop as they age, they may be even more prone to symptoms of PTSD after a traumatic event. Thus it is imperative that parents and educators know the signs of PTSD in children and teens. – Re-experiencing the trauma through intrusive distressing recollections of the event, flashbacks, and nightmares. – Avoidance of places, people, and activities that are reminders of the trauma, and emotional numbness. – Increased arousal such as difficulty sleeping and concentrating, feeling jumpy, and being easily irritated and angered. So, what should educators look for? PTSD in children and teens most frequently occurs when the child has witnessed or experienced a violent or dangerous event. Most common reasons that a child may develop PTSD involve death or injury of a parent or loved one, witnessing or experiencing physical or sexual abuse, and any unexpected disaster, including a car crash, house fire, etc. The National Center for Post-Traumatic Stress Disorder estimates that anywhere from three million to 10 million children and teens witness violence in the home every year. Since domestic and child abuse is largely underreported, the true number of cases is thought to be even higher. That said, identifying PTSD involves vigilance, as every child copes and expresses emotions differently. For teachers and family members, it is important to have all of the necessary information when dealing with children suffering from PTSD. To be proactive, adults in the child’s life should be informed about any recent trauma or violent event. Children may exhibit avoidance behaviors when something reminds them of the traumatic event. Any sort of flashback or familiarity of the event could cause extreme distress, agitation, or anxiety. Therefore, it is especially important that teachers know which subjects to avoid discussing in class, as certain topics could trigger an unpleasant memory or flashback. Also, loud noises or sudden changes in the environment could cause flashbacks and emotional distress. Children may exhibit this distress by crying, shaking, appearing jumpy or skittish, etc. This hypervigilance is an attempt to foresee the possibility of another traumatic event. It is as though the child is expecting violence or danger at any moment. This sort of hypervigilance can cause sleeplessness, lack of focus, anxiety, and severe shifts in behaviors and emotions. 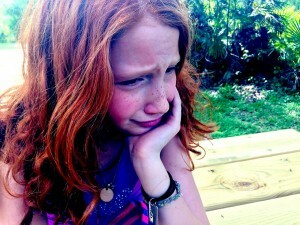 While some children may exhibit extreme temper tantrums, others may cope in an opposite manner. In an effort to self-soothe, some children may refuse to speak or fail to respond to comfort. In some cases, children and teens with PTSD exhibit selective mutism, in which they refuse to speak, interact, or make eye-contact with anyone. Since symptoms and age of onset of Post-Traumatic Stress Disorder vary from child to child, treatment options are just as diverse. Some cases of PTSD in children have been known to dissipate on their own after a few months. However, it is not recommended that PTSD symptoms be ignored in the hopes that the condition will fix itself. Different therapy options, such as cognitive behavior therapy, crisis management therapy, and play therapy offer various methods for children and teens to confront past trauma. The most important thing that parents and teachers can do is be vigilant and aware of behavioral, academic, and emotional changes in the child.